A lot of people dream of building a new home but either cannot wait or cannot put up with the stress, so near new homes can be a great option. You get all the benefits of a new home but without the stresses of building. It also allows you to see exactly what you are getting, maybe with some extras included. Brand new homes often are very bland with no features that make a house a home, and that is just on the inside. When you look at new subdivisions the gardens are often just a small area of grass with maybe the odd tree. A near new home may have a lot more done to make the garden a place to relax with planting already done. Plus of course many people like the fact that you get to move straight in. Do You Miss Out On Designing Your Dream? While most people dream of building a new home so they can design a home of their dreams, the reality is most people are constrained by finances and therefore end up building a standard new house off the plans from a group building company – a house and land package. Of course it will be a nice new house and it will have a lot of great features, but it might not be as special as you might have hoped. It will be predictable with finance for a new home quite easy to get. Drive into any new development and you will see a lot of very similar houses. In time the houses start to look a bit different, mainly because people will landscape the properties, the trees will grow and some people will renovate or change their houses. When you drive through some of the older suburbs you can see that the houses were once very similar too, but now you have to look closer to see the similarities. People will often say they want to “buy a do up” so they can add value, but in their mind they are thinking of buying an old run down house and then with time and money they can transform the house into something that is appealing. Many people do not consider doing the same to near new homes. It’s probably because they can see nothing wrong with them, so can see no need to renovate them. But renovations do not need to be major. Often its the small renovations and design aspects that can change the look and feel of a house. Move a door, add a window or change the colour – they all can make a huge difference and they needn’t cost too much. 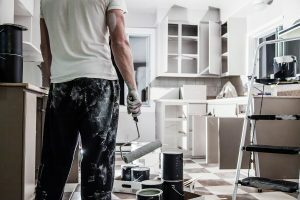 You might buy a near new house with minimum character, but spend a little on making some changes and all of a sudden you have a home that you love for a lot less than it might cost for building new. As mortgage brokers we are doing a lot of loans for renovations and extensions. That’s one reason that we say instead of building a new home or buying a new home off the plans, buying near new homes is a great option.